Caseworkers get a bad rap on both sides of the political spectrum. On one hand, they are unpopular with people who receive public assistance. Recipients and welfare rights advocates accuse them of making judgments based on racial and class bias, treating clients like criminals, and acting as if public assistance dollars are coming out of their own pockets. On the other hand, conservative politicians and critics of social welfare programs suggest that they collude with clients to defraud taxpayers, are inefficient and incompetent, and provide poor customer service. 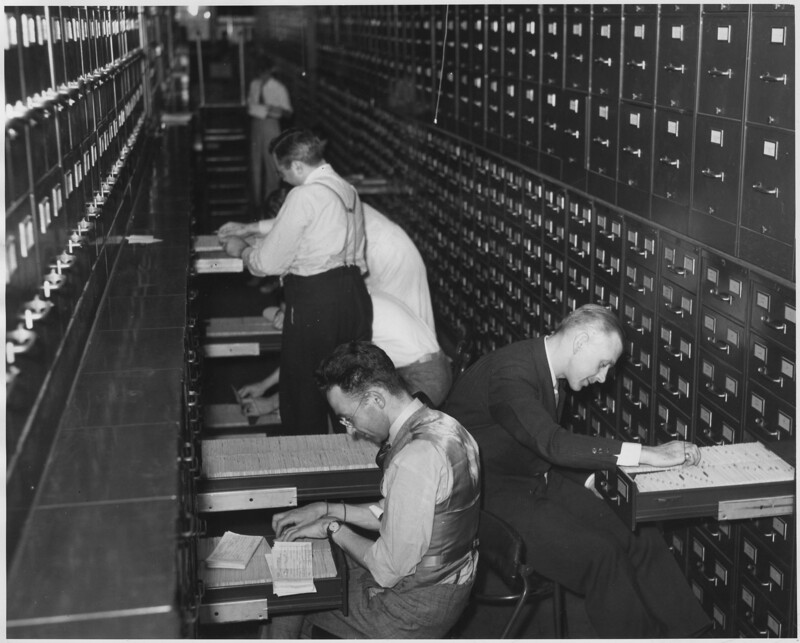 Part of the biggest bookeeping job in the world: Filing workers’ applications for social security account numbers during the New Deal. This photo is in the public domain and is available in the holdings of the National Archives and Records Administration. Automated eligibility systems –Washington’s ACES, Maryland’s CARES, Texas’ TIERS, Utah’s eRep, the multi-state Benefit Bank, among many others – have real potential to lower barriers to programs, coordinate services, and provide timely and accurate benefits information. In the best-case scenario, they also sidestep the judgment, stigma and routine invasions of privacy that characterize the client-caseworker relationship. Is automated eligibility the answer to some of welfare’s most persistent problems? Should we replace caseworkers with computers? Indiana’s disastrous 1.4 billion dollar contract with IBM to modernize and privatize their eligibility system illustrates how the hazards of replacing casework with online applications and call centers may outweigh the benefits. According to former Governor Mitch Daniels, the project was intended to improve access and services for needy, elderly and disabled people while saving taxpayers money by automating—and privatizing—back office work. Central to the plan was replacing face-to-face eligibility determinations performed by Indiana caseworkers with online application processes and call centers staffed by private employees. But problems with a system that promised more client control, fairer application processes, and more timely decisions were immediately evident. Less than a year after Indiana and IBM signed the contract, the recession, expanded federal eligibility for food stamps, and the 2008 Midwestern floods combined to more than double applications for help, overwhelming technical systems and personnel. Applications and supporting documents routinely went missing, or were damaged by fax transmission and scanning. Phone appointments scheduled to occur within two-hour blocks came hours, even days, late. If applicants were not waiting by the phone when these calls finally came through, they would be deemed “uncooperative” and denied benefits. Private call center employees were inadequately trained to deal with the scale of human problems they encountered. Performance metrics designed to speed the decision-making process created perverse incentives. To clear backlogs, benefits were terminated for the catchall reason “failure to cooperate:” an applicant missing a phone appointment, failing to call in to a helpline on time, or hanging up after being on call waiting for 30 or 50 minutes. Sheila Purdue was denied Food Stamps and Medicaid when she was unable to complete a telephone interview. Purdue is deaf. A nun’s case was closed for “failure to cooperate” because she did not call in to an interview on a day she was playing the church organ, after repeated attempts to reschedule. An eighty-year-old woman from Terra Haute lost her Medicaid when she failed to call an eligibility hot line while hospitalized for congestive heart failure. Call center workers were private employees, after all. If applicants felt they were unjustly denied and requested a Fair Hearing, Indiana was obliged to conduct and pay for the legal proceedings, not IBM. In fact, Indiana is now fighting several class action suits that claim that the state’s Family and Social Services Administration (FSSA) violated federal Food Stamp law, the Americans with Disabilities Act, and the constitutional right to due process. The experiment failed. After just three years, and in the face of a legislative challenge – a Senate bill requiring there to be a state caseworker physically present in all township offices to assist the public in applying for assistance programs – the Daniels Administration broke its contract with IBM and introduced a “hybrid” system that includes both online applications and in-person eligibility determinations. IBM sued Indiana for breach of contract, and last year, the Marion County Court ruled in IBM’s favor. The cost to Indiana taxpayers? More than half a billion dollars. Similar systems also failed in Florida and Texas in the early 2000s, but it would be a mistake to conclude that these states were the victims of bad design, poorly planned systems full of bugs. The problems with automating eligibility go well beyond technical glitches. The push to automate intake processes requires computers to do tasks for which they are manifestly unsuited – evaluating the “deservingness” of human beings. In our current political climate, the public assistance system is fixated with gauging applicants’ moral fitness for government aid. Intake processes go far beyond identifying eligibility for programs and then crunching the numbers to determine benefit levels. It’s the conditionality of welfare in the United States – not lack of technical know-how – that makes eligibility automation such a debacle. If we want to successfully modernize our public assistance programs in the United States, the solution is simple: Stop means-testing welfare programs. The Social Security Administration has successfully automated their eligibility and payment processes, and the system – based on calculating credits, not verifying income or work-readiness – is widely seen as both easy-to-use and efficient. Another solution may lie in unconditional cash transfers. The organization Give Directly connects donors with people in need in Kenya, delivering funds right to their cell phones. The organization’s overhead is less than 8%; 92.6% of money they raise goes directly to people who need it. Ending hyper-surveillance in the welfare system might be a hard sell, but it is possible. In the meantime, let’s not ask computers to do something that us fallible humans can do so much better: supporting human growth, development, and dreams.